February 2019 – If it’s winter in Maine, it’s time to embrace the outdoors. One of Maine’s greatest winter secrets is the handful of smaller, family-run ski mountains that dot the state. When it comes to dining après ski, the dining critic of the Portland Press Herald has some great picks after a stellar year in restaurant reviewing. Need a place to stay? There’s a new hotel on the Portland waterfront. 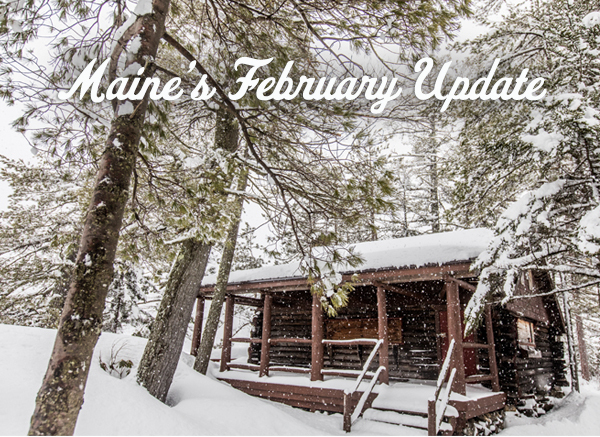 Later this winter, check out the unexpected connection between Maine and the Caribbean, consider visiting a sugar house on Maine Maple Sunday and make summer plans to explore Maine’s newest designated wilderness. For writers, editors and bloggers looking for short-lead news, there are immediate details under Happening Now. Those in search of longer lead news can scroll down to the Looking Ahead section. Maine has a handful of small, family ski mountains, places where many Mainers learned to ski. These are hills where community plays a strong role in keeping them going. Places like Lost Valley in Auburn, Black Mountain in Rumford and the community-owned Camden Snow Bowl on 1,300-foot Ragged Mountain, which offers skiers dramatic views of the Atlantic Ocean. 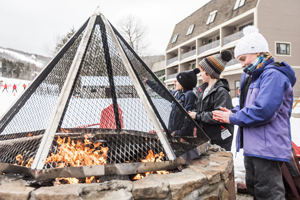 In Bridgton, Shawnee Peak prides itself on providing families with a nostalgic, fun ski experience. At night, six lifts service 19 trails and three terrain parks can be skied under the lights. Mt. Abram has 10 beginner, 21 intermediate and 13 expert trails, making it a great mountain for families. Go to Visit Maine for a complete look at Maine’s family ski resorts. When Portland was named 2018 Restaurant City of the Year by Bon Appetit magazine, it was a great honor and a mark of the city’s coming of age from a lively food scene to an established culinary destination. What’s hot right now? According to Andrew Ross, restaurant critic of the Portland Press Herald, the best new restaurant of the year was Elda in Biddeford, where he admired “chef Bowman Brown’s deft hand at pulling new textures and flavors from the simplest ingredients.” His single favorite meal was at Drifters Wife in Portland: “What’s not to love about chicken prepared “al mattone”-style (weighed down in the pan with a brick), served with parsnips and green garlic,” he writes. Ross also singles out the surf and turf sandwich at Highroller Lobster Co. in Portland, “a brisket blend cheeseburger topped with lobster meat and a thick impasto of jalapeño mayo. I can’t imagine anything less kosher, except the same sandwich with a slice of bacon. (Which, by the way, is also an option. )” Read more of Ross’s Maine dining picks at the Portland Press Herald. The newest hotel in Portland is the AC Hotel Portland Downtown/Waterfront. Located at 158 Fore Street, this luxury hotel, across from Ocean Gateway pier II, features a chic minimalist European design. There are 178 guest rooms, a 40-seat restaurant, an outdoor patio, 2,700 sq. ft. of meeting space and a 24-hour fitness center. The AC Lounge has outdoor water-view seating, signature cocktails and a tapas menu. The property is ideally located two blocks from the shopping and restaurants of the Old Port District and is the only hotel in Portland with unobstructed views of Casco Bay. Visit the AC Hotel Portland Downtown/Waterfront. Since Katahdin Woods and Waters National Monument was designated by President Obama in 2016, it has remained a wild area with little infrastructure on its 87,500 acres. The vast area lies east of Baxter State Park, but visitors will find no welcome center or staff. In order to make it a bit more accessible, the National Park Service has contracted with the Appalachian Mountain Club (AMC) to build a series of hiking trails. Each trail will extend one or two miles out from the main Loop Road, giving visitors at least a taste of this wilderness. There will also be a new trail to Deasey Pond and an ADA-compliant trail to Lynx Pond, with a viewing platform at its terminus. Trail construction commenced in October 2018 and will continue through fall 2019. Katahdin Woods and Waters may be part of the National Park Service, but the AMC says that the property shares many of the same recreation and conservation goals as AMC’s neighboring 75,000-acre Maine Woods Initiative, which will celebrate its 15th anniversary in 2019. Visit Katahdin Woods and Waters. The calendar may have other ideas, but in Maine, the unofficial start of spring is Maine Maple Sunday, which falls on March 24 this year. 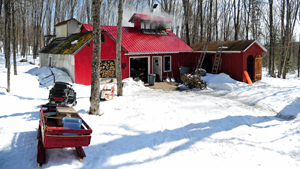 Nearly 100 sugarhouses across the state will offer free maple syrup samples and demonstrations on how pure Maine maple syrup is made. Many farms offer games, activities, treats, sugarbush tours and music. The day is a long-standing Maine tradition among Maine’s maple producers, and most samplings and tours are free. Go to Maine Maple Producers for more details. There’s a remarkable connection between Maine and the Caribbean and it’s on display through May 5, 2019, at the Maine Maritime Museum in Bath. The Tropics Next Door: A Look at Maine and the Caribbean shows how the islands were regular trading stops in the days of sail, and Maine mariners and their families came to know the region well. The exhibit uses objects of trade, accounts, personal sketches, artworks, photographs and souvenirs to explore this relationship. 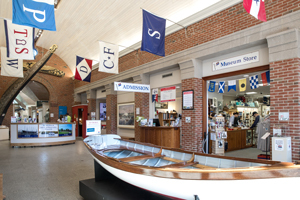 Visit the Maine Maritime Museum for more details.